Melita Markey with her family. LABOR candidate for Stirling Melita Markey has been on the ground campaigning locally for more than a year. 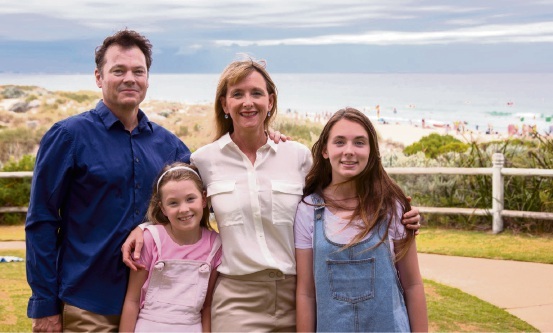 As a proud member of the local community, Melita lives in Karrinyup with her husband and two daughters and works on Main Street in Osborne Park at the Asbestos Diseases Society of Australia Inc.
“My family and I love being part of the Stirling community but I think we can make it even better,” she said. “Upholding the values of fairness, social justice, and equity is important for me. Melita said this has been echoed throughout the campaign as people in Stirling have expressed their concerns to her about access to properly funded education and healthcare services, protecting Medicare, and the lack of job security in WA. Following in the footsteps of her parents Rose Marie and Robert Vojakovic who founded the Asbestos Diseases Society of Australia in 1979, Melita has fought hard to provide justice and medical and legal support to the victims of asbestos-related diseases. Through her work at the ADSA she has seen firsthand the devastating effects of asbestos, and more recently silicosis, on the lives of men, women and children. “We need to maintain our world-class health system and protect it from the Liberals’ constant cuts,” she said. “Every dollar cut from our local public hospitals like Osborne Park Hospital is a dollar cut from our sickest and most vulnerable patients. Another priority for Melita is investing in education. “We need to give every child, in every school the best start in life, that’s why education is at the very top of Labor’s policy priorities” she said. “As a mum of two I know how important it is that we properly fund our schools in Stirling. Melita said the Stirling community is calling out for change. “For more than a year I have been door knocking, phoning and speaking to residents and it’s clear that Stirling has been taken for granted for too long,” she said.